Now that we know about IGP based LSP forwarding on Junos, the 2nd part in this series focuses on BGP and table inet.3. We also continue from where part 1 left off, by looking at how traffic-engineering bgp-igp and mpls-forwarding can affect route redistribution from OSPF into BGP. For this lab, I’ll be using the topology below. As with Part 1, the base configurations are using OSPF as the routing protocol and LDP to exchange transport labels. Here’s what I changed on Junos 1. The OSPF route 102.102.102.102 learnt via OSPF from CE2 will be redistributed in to BGP. OK show what happens if I change over to traffic-engineering bgp-igp on Junos1? The LDP route becomes the active route for routing and forwarding, and isn’t matched by my policy, so is not advertised to Junos2. We’ll now have a look at how BGP operates. I’ve set the “traffic-engineering” on Junos1 back to the defaults. We should expect BGP to recursively resolve it’s next-hop via inet.3 and therefore MPLS route the traffic. Let’s see! Junos2 has an eBGP peering with CE1. CE has a second Loopback 112.112.112.112 being advertised via this eBGP session. So how does Junos1 route to CE2s IP address 112.112.112.112? Let’s take a look at the routing tables. The key here is the protocol next hop – 192.168.102.1. 192.168.102.1 isn’t directly attached to Junos1 – it is CE2s address on the Junos2<->CE2 segment, Therefore BGP will recursively resolve this next hop via table inet.3 and inet.0. As the inet.3 LDP route has a lower preference compared to the inet.0 OSPF route, the inet.3 route will be chosen and traffic will be placed on the LSP automatically, pushing label 27 in this case. But what about IGP traffic to the protocol next hop? Well that won’t follow the LSP of course because we don’t have “mpls traffic-engineering” configured. I’ve shown that BGP is using table inet.3 to resolve next hops, where as normal IGP routing is using inet.0. Another thing to remember with BGP & inet.3… if inet.0 contains a better route (e.g. better preference) then BGP would use the inet.0 route and traffic would not be forwarded on the LSP. In this case, as none of the P routers are running BGP, this would break the connectivity (the P routers don’t know how to get to 112.112.112.112 so would drop the traffic). Hence, the traffic has to follow the LSP for the traffic to reach CE2. Part 1 of this series focussed on the interface MTU configuration, looking how different vendors implement the setting. Some include the layer 2 headers, some don’t. Part 3 will add MPLS MTU to the mix. Database Description packet is rejected. Why would anyone actually want to increase the MTU size beyond 1500? Well, back in the day, larger packets were desirable because they resulted in less overhead on the server – fewer CPU interrupts, fewer CPU cycles wasted etc. Today with Large Segment Offload (LSO) etc the performance increase might not be what you’d expect. Take a look here for more info. As always – implement something that is suitable for your environment, and test before you do. Anyway, you are not here to debate the use of Jumbo frames or otherwise, so let’s crack on. As with Ethernet frames, the protocol MTU can be changed for IP packets. The accepted “standard” payload for a Jumbo Frame is 9000 bytes (i.e. an IP MTU set to 9000). In this post, the interface MTU will be increased to the maximum supported by the interface hardware, but for the purposes of this post and to demonstrate that the interface MTU and IP MTU can be different, we will set the IP MTU to a consistent value of 2000 bytes. The same virtual topology will be used as Part 1. Our Interface config is below, the interface MTU has been changed to 9216, and the protocol MTU to 2000. From our tests earlier, we know what this means that the maximum IP payload is 2000 bytes, which would result in 2014 bytes being put on the wire including the L2 headers. Well that’s pretty clear why there is a problem. Let’s move on to IOS-XR. Pretty clear that there is an MTU problem. Below I’ve set the Interface MTU to 9000 – remember IOS-XR includes the L2 headers in the Interface MTU, so the maximum encapsulated data on this wire would be 8986. UPDATE 23/12/15: I’m setting the interface MTU to a different value to the IOS router’s MTU setting, to show that it’s the IP MTU that is the important setting and must match for two OSPF routers to establish an adjacency. The IP MTU is set to 2000 to match the other router. Notice that for OSPF to be happy, it only matters that the IP MTU is the same on both routers, the physical MTU can be different. Finally we’ll configure the Junos router and make sure that we are able to ping with 2000 bytes of protocol data to the 1000v and XRv. The Junos configuration is as follows, I’ve not added the MTU settings yet. The neigbor isn’t going to establish so let’s add some traceoptions to double check what the problem is. OK, that’s pretty clear. Let’s fix the MTU and IP MTU. Notice that the IP MTU is configured under family inet. [email protected]> show interfaces ge-0/0/1 | match "ge-|MTU:"
Now for the ping, remember that the Junos ping size excludes the ICMP (8 bytes) and IP (20 bytes) headers , so we’ll be expecting the maximum working ping size to be 1972 bytes, for 2000 bytes of protocol data and 2014 bytes on the wire. I don’t have a Nexus in my lab, but for completeness below is the config for updating the MTU on NX-OS. Make sure you check the Interfaces and Vlan interfaces have the correct MTU. That’s done with the interface command “mtu X”. For Layer 2 interfaces, configure either the default MTU size (1500 bytes) or up to the system jumbo MTU size. 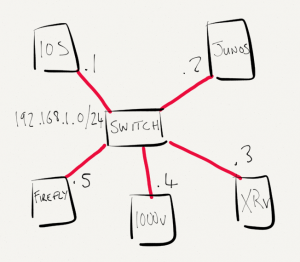 In this post I’ve shown how the physical MTU can vary from the IP MTU, and how it’s important to have the same IP MTU when working with OSPF. 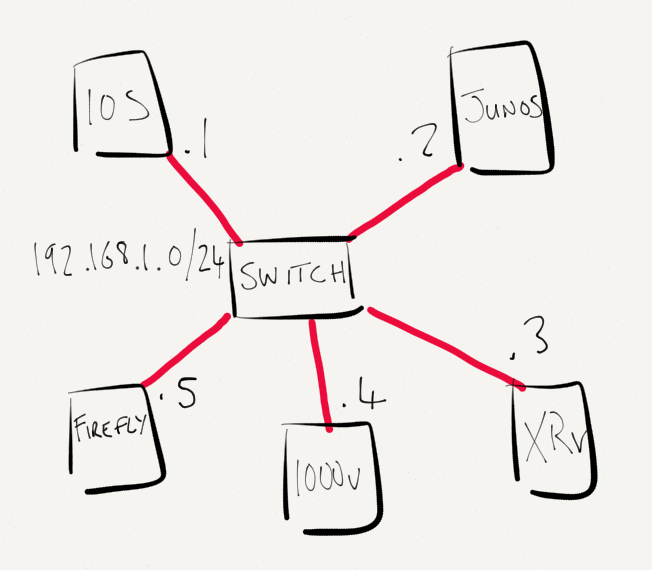 Also discussed were debugging steps to troubleshoot OSPF MTU issues on IOS and Junos. Gotta love Junos for keeping things consistent!